A survivor of Nazi occupation, Fanny Krieger left her native homeland of France and came to America, she was seventeen. Her friends had predicted she would marry "The King of Chewing Gum." After searching for him for five years in New York, Fanny moved on to new adventures which took her to Houston, Texas. There she met Mel whose ultimate ambition was to have a business with a sign that read "Gone Fishing." Fanny knew nothing of fishing, but got Mel to take her on a fishing date. She had met her "King." And so started her new life. 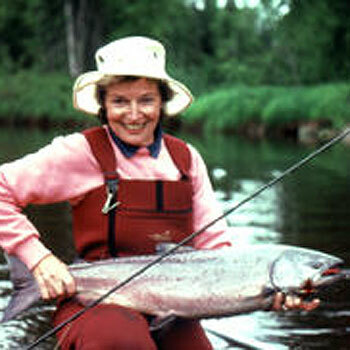 Fanny Krieger has been involved with fly fishing instruction for over 25 years. Listen in to find out how she unravels the mystery of fly fishing for children of all ages into a simple, easy to understand and fun adventure. In the early 1960's Mel and Fanny moved to San Francisco with their two small children. Mel began his flyfishing tournament casting and more and more time was spent fishing by the whole family. In later years flyfishing became the source of their business, but in 1964, Fanny started a business called Trans World Visa Service securing visas. It was used by travel agents and their clients from all across the U.S. She ran this business by herself from their apartment till it grew into its own office space with several employees. In 1983, Fanny and a friend, Susan Williams, started The Golden West Women Flyfishers. It now has over 150 members and is very involved with conservation, education, social and fishing programs. The club has been the inspiration for many women looking for friends in the world of flyfishing and for clubs which have sprung up since. In 1994 Fanny was inducted into the Northern California Council / Federation of Flyfishers Hall of Fame for her contributions in the world of Flyfishing. In 1996, Fanny conceived the concept of a gathering of many other flyfishing ladies and fly fishing clubs into a festival. With the help of the Golden West Women Flyfishers' president, Arlene Marcus, Fanny convinced the club to sponsor a festival for women flyfishers. This idea received strong encouragement and support by many men in the flyfishing community. After much hard work and many meetings, in San Francisco on Dec 6-8 of 1996, the International Festival of Women Flyfishers was born. Writers, artists, guides, instructors, shop owners, lodge owners and fishing enthusiasts participated. The response was ardent. In 1997 the 2nd International Festival of Women Flyfishers was held in Baja California. At this 2nd Festival, with unanimous support from all present, Fanny promoted the idea for a new organization - International Women Flyfishers. Fanny now runs and coordinates her fishing related enterprises: travel adventures for fly fishers and the library of instructional videos and books. In 2010 Fanny produced a new DVD of instructional fly fishing for young people: "Tomorrow's Fly Fishers," winning The 2011 Kudo Award from Fly, Rod & Reel Magazine. It is now part of the Krieger Collection. A happy and proud mother and grandmother she lives in San Francisco one block from Golden Gate Park.